Stay cozy and warm: Put together quickly, “quick” breads not only taste great, but make the whole house smell delicious when coming in from the cold. One day you’re the best thing since sliced bread, the next you’re toast. “Quick” breads use baking powder or baking soda instead of yeast to make them rise. They don’t require much, if any, kneading. They don’t take hours to rise. Put together quickly, they not only taste great but make the whole house smell divine when coming in from the cold. These breads probably will not see the light of the next day to become toast. You can eat them “quick,” too. Bake bread, stay warm, and let it snow! Spread a little extra peanut butter between slices of the following bread, add sliced bananas or apples, a drizzle of honey, and maybe a slice of bacon for an interesting sandwich combination. Sift or stir together flour, baking powder, salt and sugar. Add peanut butter and butter, cutting with a pastry cutter, two knives or use your fingers, until mixture resembles coarse crumbs. In a small bowl, beat together egg, milk and orange rind. Pour batter into a well-greased 9x5x3-inch loaf pan. Bake for 60 minutes or until a toothpick inserted in center comes out clean. This bread goes well with a fruit board. Also good with chili, barbecued chicken, ribs or wings. Add cold butter, and with a pastry cutter, two knives or use your fingers, cut in the butter until mixture resembles coarse crumbs. In a small bowl, combine the milk and eggs, and add to the cheese mixture. Stir until just combined. Pour or spoon into a 9x5x3-inch greased and floured loaf pan. Bake for 50-60 minutes or until bread tests done when a toothpick inserted in center comes out clean. 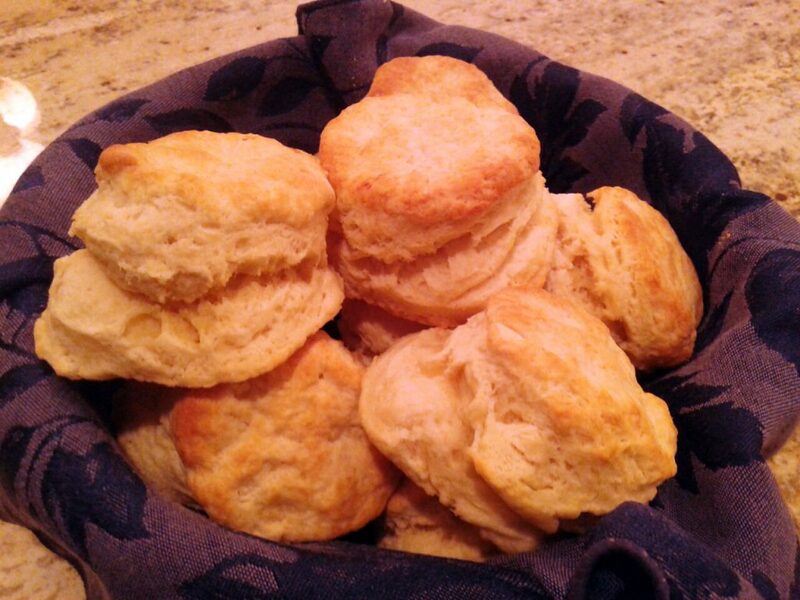 The following recipe produces light, fluffy, mile-high biscuits that are delicious for breakfast, lunch or dinner. In a large bowl, sift together the dry ingredients. Cut in the butter with a pastry cutter, two knives, or use your fingers, until mixture resembles coarse crumbs. In a small bowl, combine egg and milk using a fork or whisk. Add egg/milk mixture all at once to flour mixture, and stir with a fork, only until dough forms a lump. Turn the dough out onto a lightly floured surface, and knead it very gently only a few times using the palms of your hands. Gently pat the dough into a rectangle shape about ¾-inch thick, and fold it into thirds like folding a letter, then gently roll over the dough using a floured rolling pin until dough is ¾-inch thick. Use a biscuit/cookie cutter (about 2¼-inch diameter) dipped in flour, and cut biscuits straight down. Alternatively, biscuits can be cut into 2¼-inch squares. Place biscuits on an ungreased baking sheet about 1 inch apart. Serve warm. Makes 12 biscuits. Eat well, live long, enjoy! Send in your favorite recipe for a chance to win a $100 ShopRite gift card. 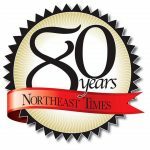 Mail your recipe to Readers’ Recipes, c/o Northeast Times, 2 Executive Campus, Suite 400, Cherry Hill, NJ 08002. Or email your recipe to WhatscookinNEPhilly@gmail.com. Please include name, address and telephone number.